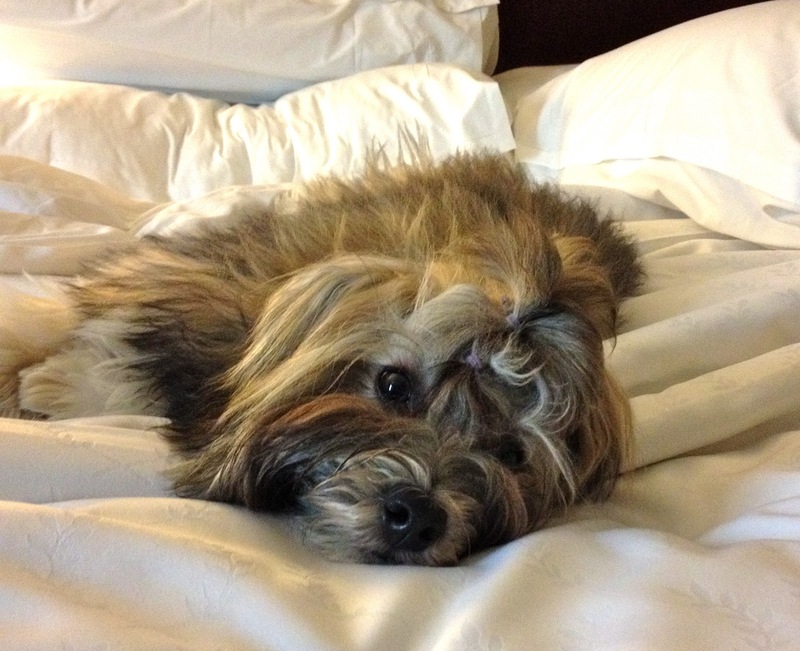 Rocco Havanese passes out after BlogPaws! We're recovering from a whirlwind weekend at BlogPaws with so much information to digest and photos to download and sort through! From the sponsors and exhibitors to the educational sessions there was so much to see and learn. And of course, one of the best parts of the conference was seeing old friends and meeting new ones! We heard there were about 500 attendees and more than 80 dogs! Wow! I remember the very first BlogPaws where Cosmo was one of very few dogs in attendance. This year, Rocco made his BlogPaws debut and I think he handled all the activity perfectly, especially since he's only eight months old! We'll download all our photos to our Facebook page in the next few days, but in the meantime, here's something fun to watch! Almost every Monday night for that last four years or so, we've participated in the Twitter discussion/party called #Petchat, hosted by Elly @Petchat and Ron @PianoWeatherman. After all this time, we finally met Ron, Elly and pup Schmitty in person this past weekend at BlogPaws, and we had such a great time! Assisting Ron and Schmitty in the weather forecast, above, are some of the rest of the regular #Petchat crew! Follow #Petchat on Twitter every Monday night starting at 8 p.m. ET. Another great thing about pet-related social media conferences, is that you don't have to wait a whole year to do it again. BarkWorld Expo is August 22-24 in Atlanta, and if you haven't already registered, you can register now for BarkWorld! You'll learn plenty from both conferences to make it worth your while to attend both of them. See you at BarkWorld and then next year in Las Vegas at BlogPaws! Ha, that looked like fun! Rocco looks like a natural up there! We had a blast! Rocco loves to meet people and pups too! It was so great to chat with you this weekend! I adore Rocco and his ridiculously soft rockstar hair. Thank you! It was so great to see you too and huge congrats on your big win!! Such an amazing video! We love our #petchat friends! We hope you and Rocco enjoyed your visit to Northern Virginia! See you online and next year! We had so much fun seeing and meeting everyone. What a hot-looking Mcee!! No wonder he is sooo tired! Hehe! Rocco knows how to work a room! 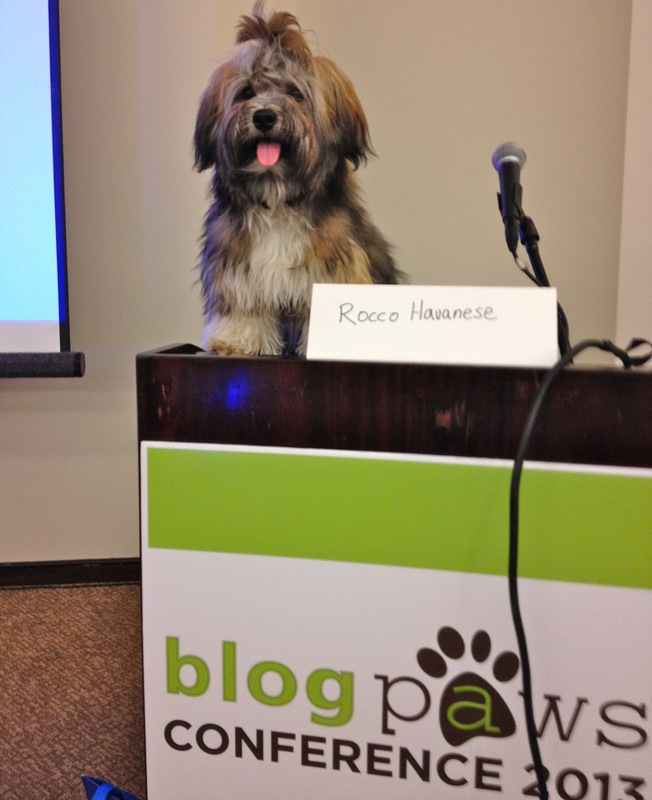 My Dad said it was so nice to see you and Rocco at BlogPaws. He said that Rocco is the softest woofie ever! It was great to see your Dad too! Rocco is a softie, that's for sure! Hmmm...we know of BarkWorld but are not sure if we should go there or not. That would actually be something I could attend because it would be driveable. Something to consider. It was soooo great seeing you again at BlogPaws!! It was so good to see you again and to meet little Rocco! I agree - he did an amazing job for a pup. He's adorable! Rocco looks bushed! I bet you are too! It was great getting to see you again. See you at Barkworld! Rocco was awesome! Can't believe he's only 8 months old! Normally puppies are all crazy (and kind of scary sometimes) but Rocco was so well-behaved we thought he was an adult doggie. We're so glad you came walking with us on Sunday and we got a chance to talk and get to know you! Keep up the agility, Rocco - that's a great thing to do with your momma and will help you in all kinds of ways as you get older. Hope to to see you at BarkWorld!